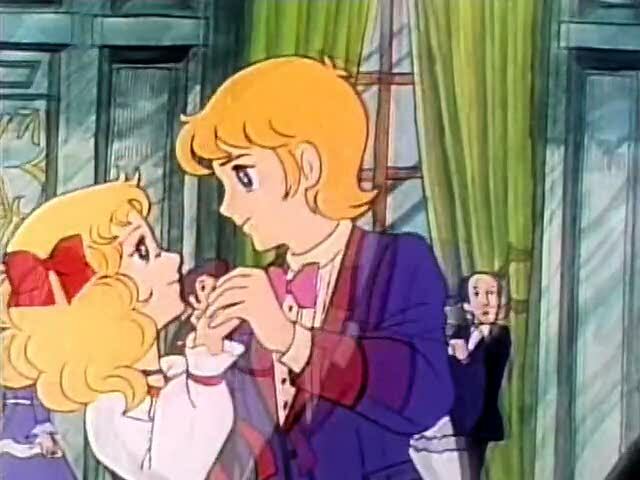 Candy Candy episode 11 review; the bonds of love still hold. 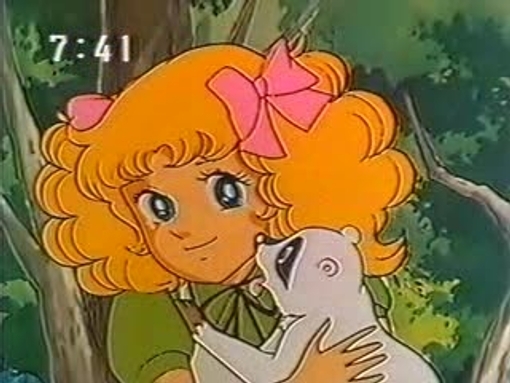 This episode begins with Candy finding out from the gardener that Mr. Brighton will be visiting the Leagans, and this means that Candy will see Annie again. 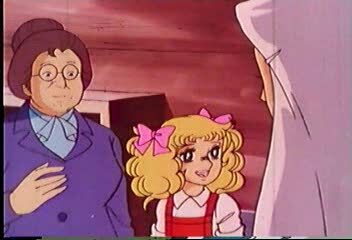 But, when Mrs. Brighton and Annie arrives at the house, Annie refuses to acknowledge Kurin’s presence, and when Mrs. Brighton see’s Candy she asks for a private room to speak with Annie. 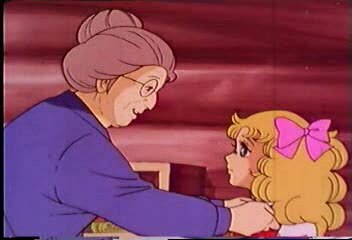 Later, we see Mrs. Brighton telling Candy, in Annie’s presence, that it must not come out that Annie came from an orphanage, so if Candy values Annie she’ll act like she doesn’t know Annie, with much sadness Candy agrees. When Candy returns to her barn she sees Neil messing around with something, and it turns out that he’s hiding a broken spur. 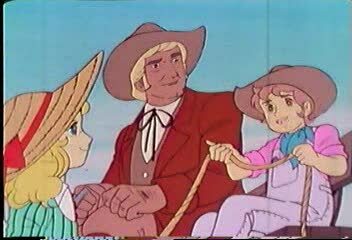 Later, we see Eliza and Neil invite Annie for a horse ride even though she’s frightened of the idea. Outside the barn, Candy drops to her knees and lifts Annie on to the horse. When Annie mounts the horse, Neil scrapes its backside with the broken spur causing the horse to run off in terror with Annie screaming for help. 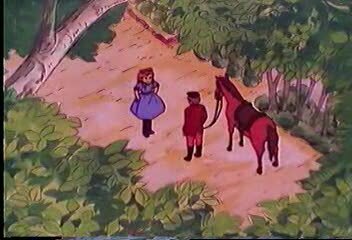 As Neil and Eliza place the blame on Candy she mounts the other horse and gives chase to Annie. 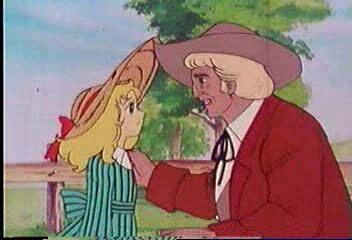 When Candy catches up with Annie they tie the horses up and sit down for a talk, and while Candy talks about Pony Home, Sister Lane, and John, Annie says nothing. 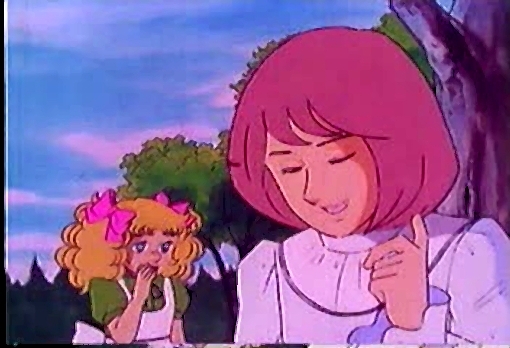 Candy tells Annie that they’re alone so she can talk. 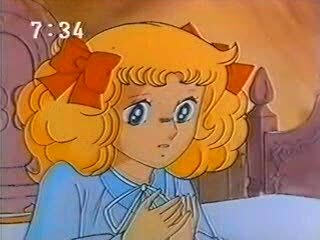 Annie breaks down in tears telling Candy that she had to/was forced to forget everything; Pony Home, Candy, John, and everyone else, she has to be a Brighton, she has to do this to protect her future happiness. 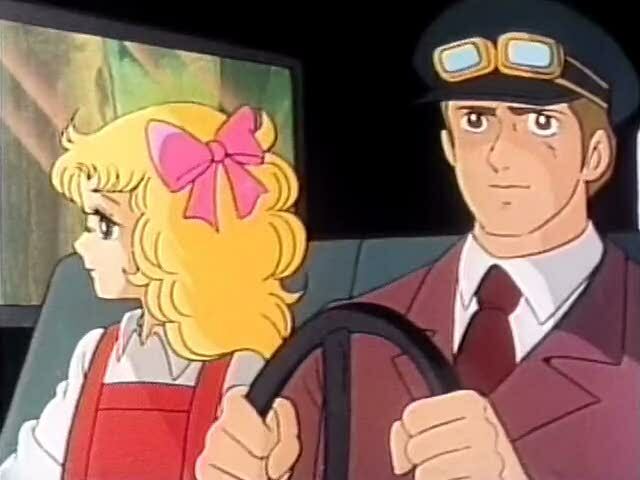 Just as Candy is about to say something to Annie, a car from the Leagan’s shows up and tells Annie they came to her, and that Candy’s in trouble. 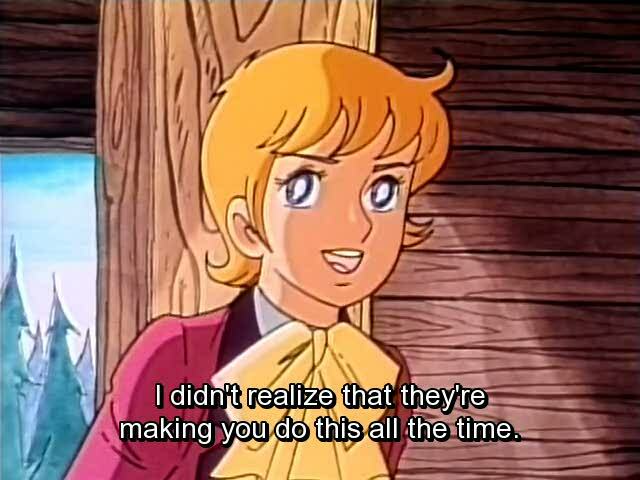 When Candy and Annie return to the house, Mrs. Leagan and Eliza blame the whole thing on Candy saying that she was the one who caused the horse to bolt. Candy denies everything and says Neil was the one who did it, Candy rushes into the other room and tells Neil to be a man and tell the truth, and Neil refuses. Candy assaults Neil and tells him if he ever goes near Annie again she’ll make him pay. 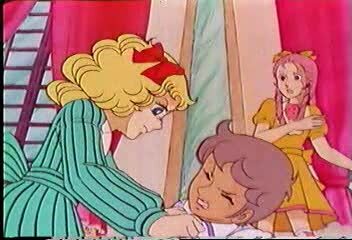 After the other servants save Neil from Candy, Mrs. Leagan and Eliza try to get Annie to say that this was Candy’s fault. 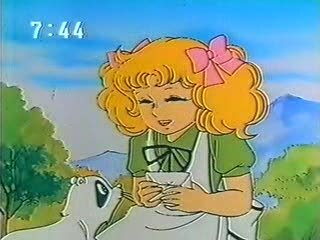 Annie looks from Candy to the others and she begins to cry and tells her mother she can’t take this. Mrs. Brighton defuses the situation by saying that if Candy did this she never meant to hurt Annie, so an apology should do. 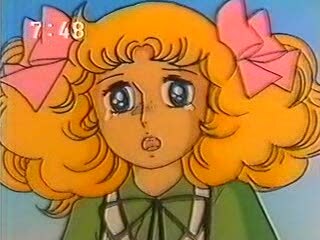 Candy looks around the room and sees Annie in tears. Candy then apologizes to the group and runs off in tears back to her barn. 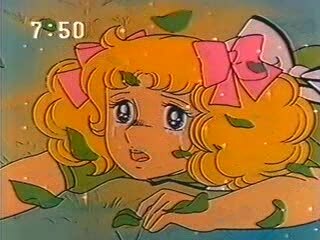 While Candy is crying in the barn, the gardener tells Candy that he’s sorry because he saw everything and didn’t have the courage to say anything. 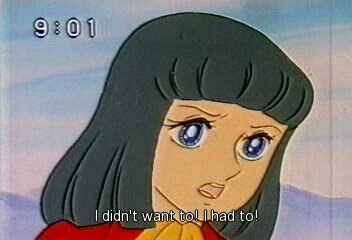 Candy tells him that she’s sad not because people tried to blame her, but she’s sad because she lost someone she considered to be her sister. 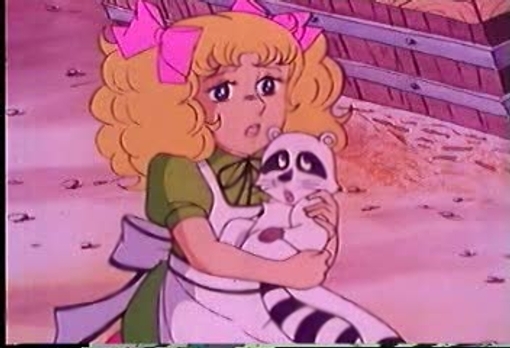 The gardener tells Candy that she didn’t lose Annie, because when Annie screamed in terror, she didn’t call for her mother or father, she called for the person that she loved and trusted the most, Annie called for Candy to save her. 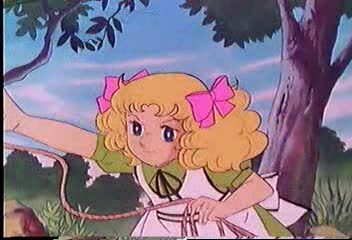 When Candy stops crying she sees Mrs. Brighton and Annie leaving, so when Candy rushes from the barn to chase after them she sees that Annie has tied her beautiful hair ribbon to a tree near the barn where Candy is living. 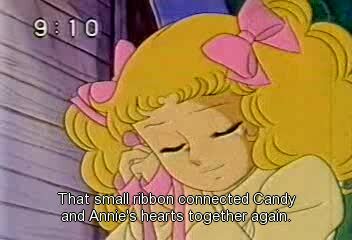 Candy takes the ribbon inside and says that this is a token of the friendship that Annie still feels for Candy. 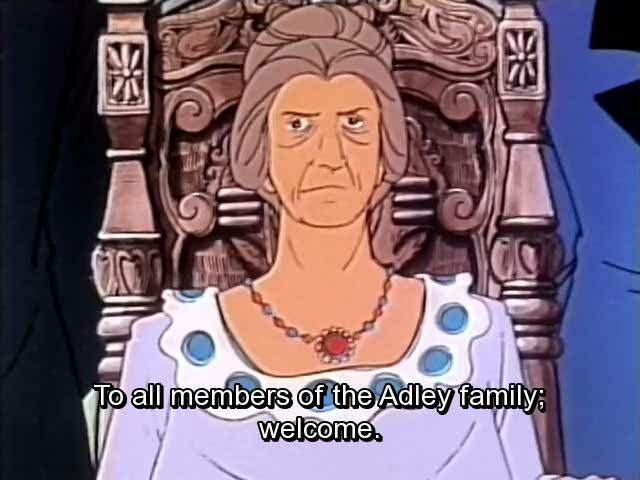 Well, that’s all for this episode. Well, Candy finally gets to see Annie after about three years have passed since she left Pony Home and Annie refused to acknowledge either Kurin or Candy. Annie left Pony Home to find her happiness and in exchange for a nice house and a “mother” and a father, she’s sold her soul. While Annie was at Pony Home she was a quiet and shy girl, but now Annie is not only quiet and shy, she’s now a broken and unhappy child. 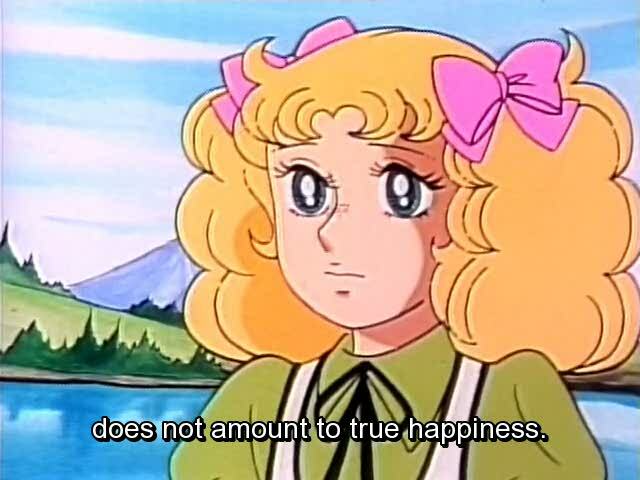 Sister Lane reminded Candy about the promise of false happiness by telling her that nice dresses and a nice room is not true happiness, but she should have saved the speech of Annie. Sister Lane also told Candy to not let herself be broken, and while Candy suffers at the hands of the Leagan’s, she is still Candy and she still owns her soul. Annie is a broken and unhappy girl, and while she may sleep in peace she has to live the nightmare of renouncing her true self. 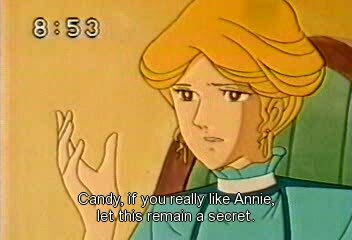 While Annie was forced to renounce Candy and her own self-worth she did manage to leave Candy a small message that she still loves her. 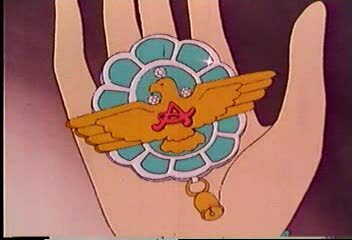 Maybe this gesture is a small flicker of hope that Annie can one day come to terms with her identity and her own heart’s desire, but until that day comes, Annie will be just a bird inside a gilded cage. 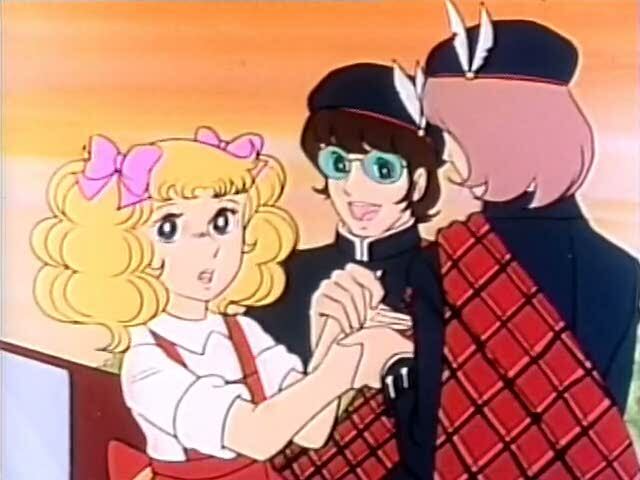 Candy Candy episode 10 review; The barn princess and her court of loving friends. 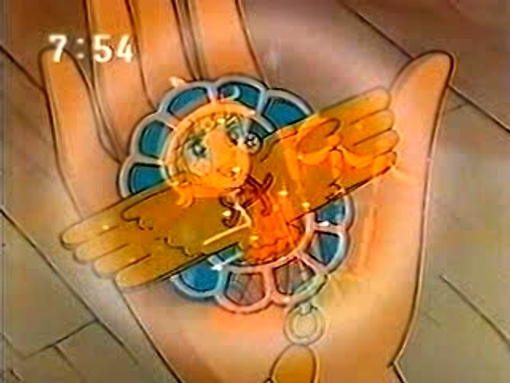 This episode begins with all the kids at Pony Home being read a letter from Candy telling them how great of a time she had at the dance, she includes a drawing of her dress, and they think that Candy looks like a princess. Meanwhile, back at the Leagan’s house, Candy gets the news that since she’s not a member of the family they’re moving her from the house to the barn. 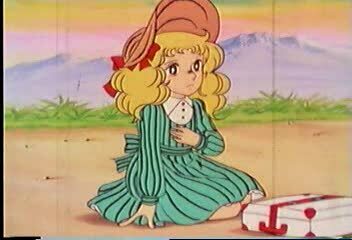 While Eliza and Neil try to depress Candy, she vows to make friends with the horses and not let this action get her down. Later, Candy spots Anthony outside the house and when he sees her she goes over and they talk. 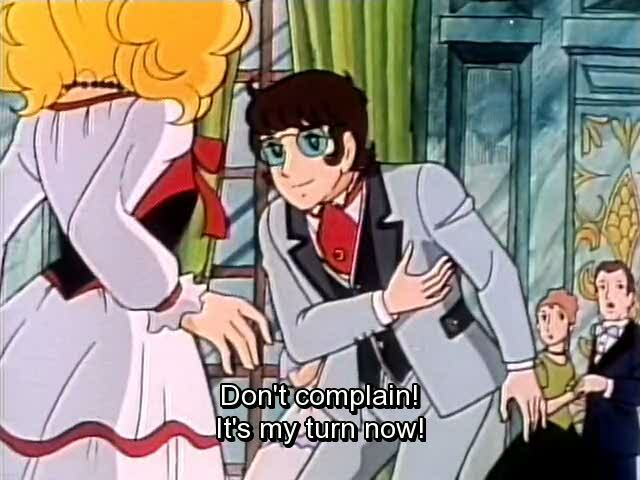 Candy offer to help him with some lifting, but when she trips and falls, Anthony notices the rough appearance of her hands and he doesn’t seem happy. Later, as Stear is driving his car down the road he almost runs over a little boy who’s walking down the road, and back at the barn, Candy is washing down the horses. 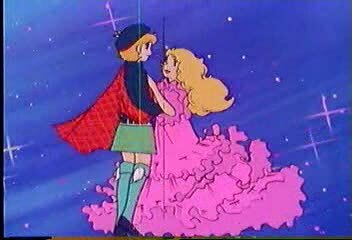 When Stear arrives at the house, it turns out that the boy is none other than John who’s walked all the way from Pony Home to see Candy in her dress. Just as Candy is about to tell John about the barn, Dorothy comes out of the house and plays along with helping Candy pass off that everything is all right. 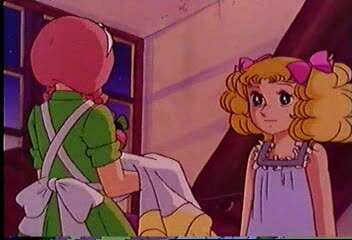 While Candy isn’t too happy about this, she decides to go along with Dorothy by showing John Eliza’s room and passing it off as her own. While the Leagan’s weren’t supposed to be back until late it seems that they’re coming back earlier than expected. 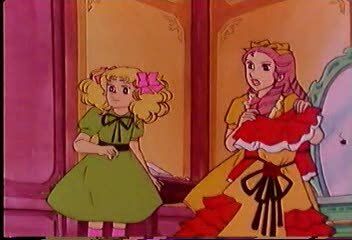 As Candy is modeling her dress for John, Eliza walks in the room and begins insulting both Candy and John, but before it can go too far the mother walks in and tells Eliza to cut it out. 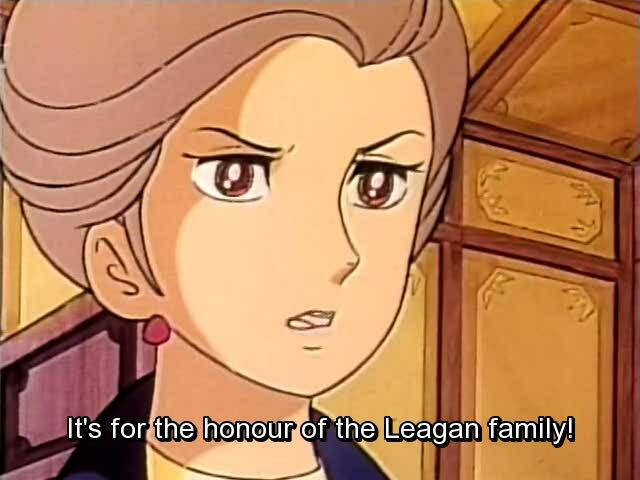 We then find out that Sister Lane has come to fetch John and the mother says that they need to keep up appearances for the honor of the Leagan household. Well, it seems that John felt that if he ran away it would force a meeting between Sister Lane and Candy, so they could check on her. 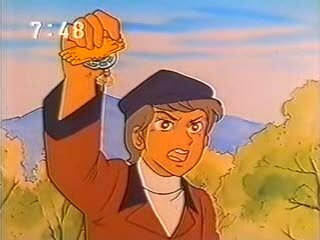 Later, as John is playing with Kurin he finds out that candy is sleeping in the barn but Candy tells him not to tell the sisters. 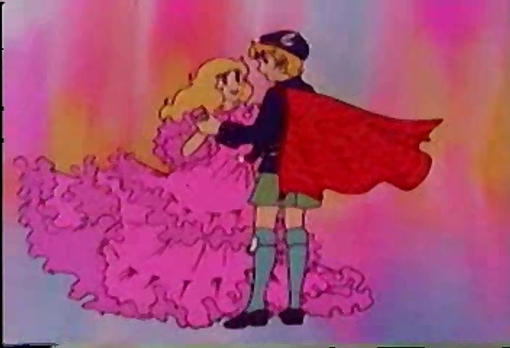 Candy tells him that the only way she’s not a princess is if she gives in to the real princess. That evening, Sister Lane, Candy, and John share the same bedroom and Sister Lane tells Candy that now she can be a peace after seeing her. 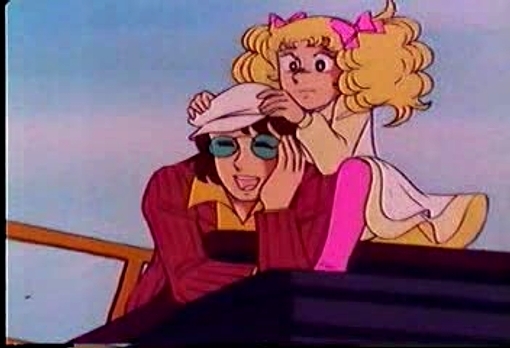 John tries to spill the beans about Candy’s treatment, but Candy stops him from doing it. We can see that Sister Lane knows something is terribly wrong here, but all she does is cry in silence. 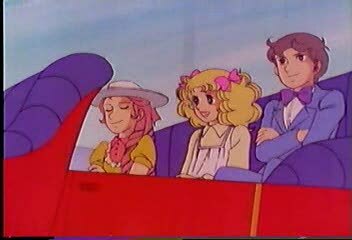 The next morning, Mrs Leagan has Candy ride with Sister Lane and John halfway beck to Pony Home, and as they’re driving down the road Stear and Archie catches up with them in Stear’s car. 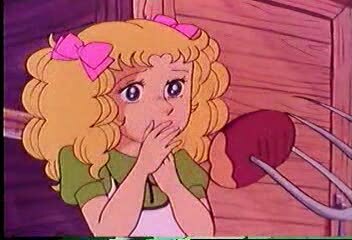 After Stear and Archie introduce themselves and tell Sister Lane that they’ll look after Candy, Sister lane asks to speak to Candy in private. She tells Candy that she had come to take her back to Pony Home, and that she knew Candy was having a tough time here, but she feels better after knowing that Candy has friends that love her. 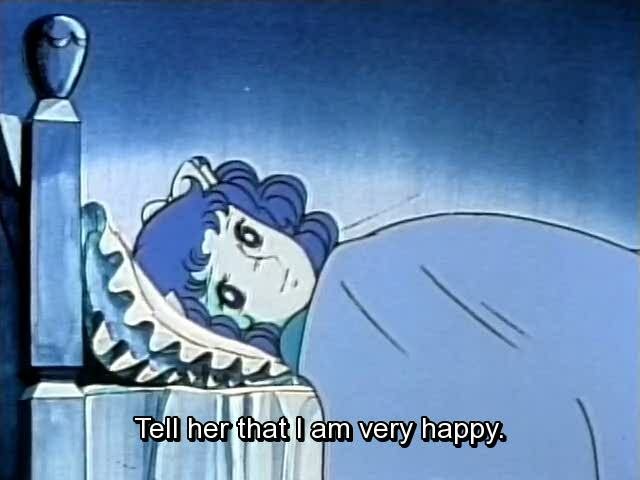 She tells Candy that putting on a pretty dress and sleeping in a nice room is not happiness, but she also says that now that she knows Candy has so many friends she won’t force her home. 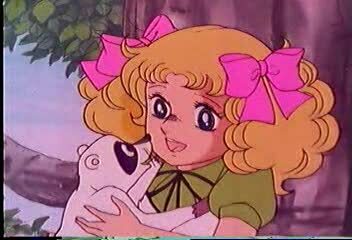 She tells Candy that happiness is having a warm heart and good friends, and Candy agrees with her. After Sister Lane and John leave, Stear asks if anything happened between her and Anthony the other day, and Candy tells them it was her hands. Later, when Candy’s inside the barn Anthony stops by and gives Candy a rose and tells her that he didn’t know they were working her so hard. 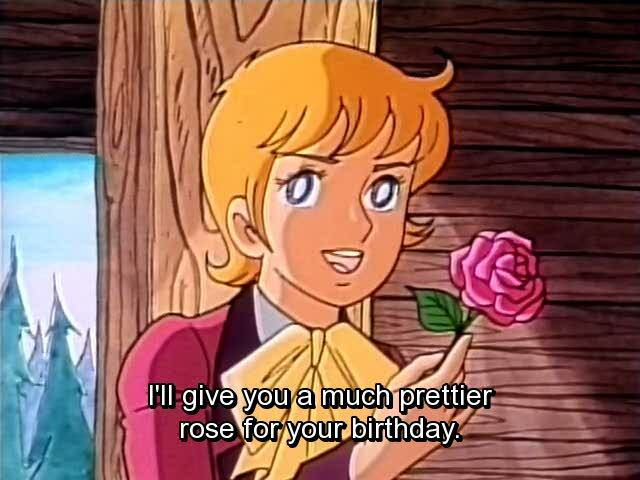 He tells Candy that next time they meet he’ll make that her birthday and he’ll give her a even nicer rose. Then, Anthony holds his arms out for Candy and when she takes his arms he promises her that next time they meet it’ll be her birthday. Well, that’s all for this episode. 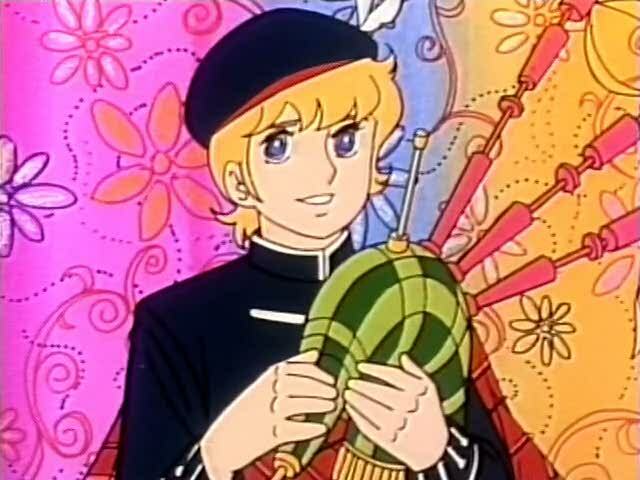 Well, every time something nice happens to Candy something equally bad or even worse come along to spoil it, ahhh…….such is life for our poor orphan. 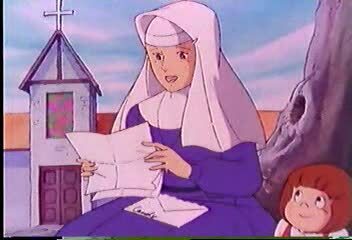 What I found very interesting was that even though Candy always sent nice letters to Pony Home Sister Lane knew that something was wrong with Candy. What was equally interesting was that Sister Lane had come to take Candy back but decides to leave Candy there once she sees that while the Leagans treat her poorly she’s surrounded by other loving people. 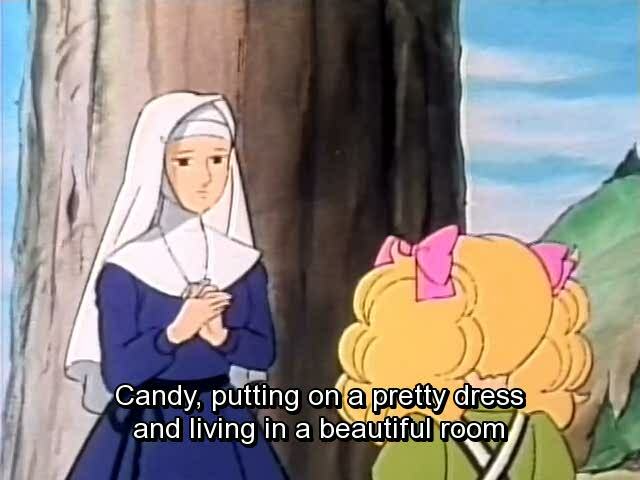 I liked the warning about false happiness that Sister Lane leaves Candy with that “putting on fancy dresses, and living in a beautiful room is not true happiness. 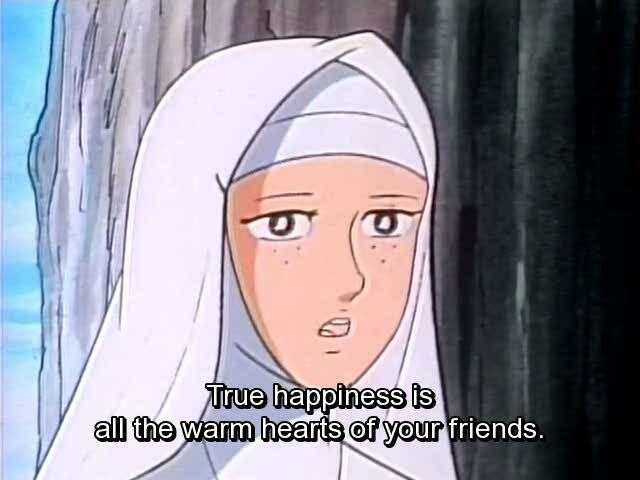 Trues happiness is the warm hearts of your friends”. 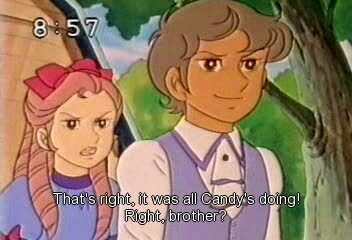 The meaner and crueler Eliza treats Candy the more Anthony, Stear, and Archie despises her for her actions, and while Eliza desires Anthony she’ll never have him because his heart belongs to Candy. 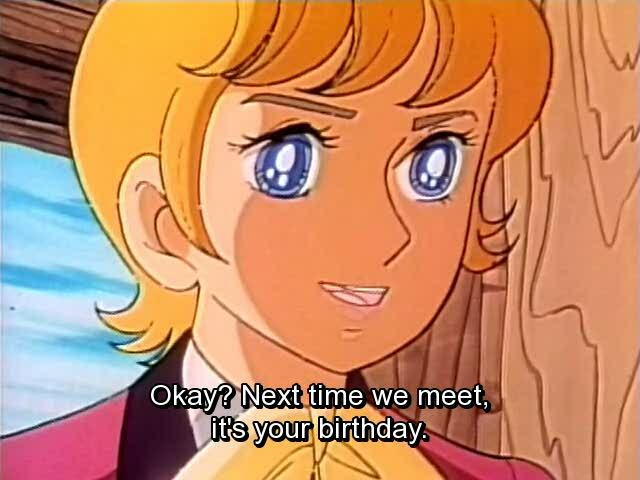 I really look forward to watching Candy enjoy a moment of sweetness when Anthony gives Candy her birthday present. 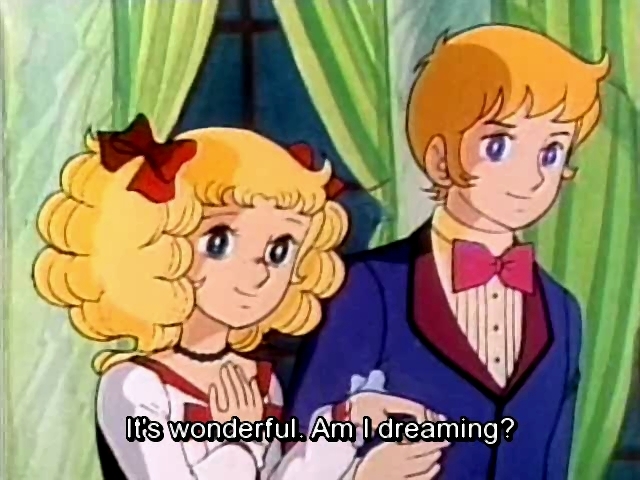 Candy Candy episode 9 review; Candy, the belle of the ball? 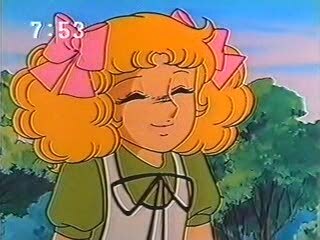 Well, the day of the big party arrives and Candy has no proper dress to wear, and with Dorothy’s encouragement Candy decides to go wearing her normal clothes. 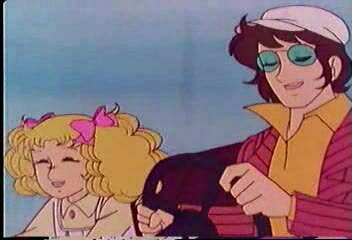 On the way to the party, Neil and Eliza make fun of Candy’s lack of proper dress. Eliza prays that Anthony will notice her, and Candy gets warned about grand aunt Elroy, she expects politeness and courtesy. 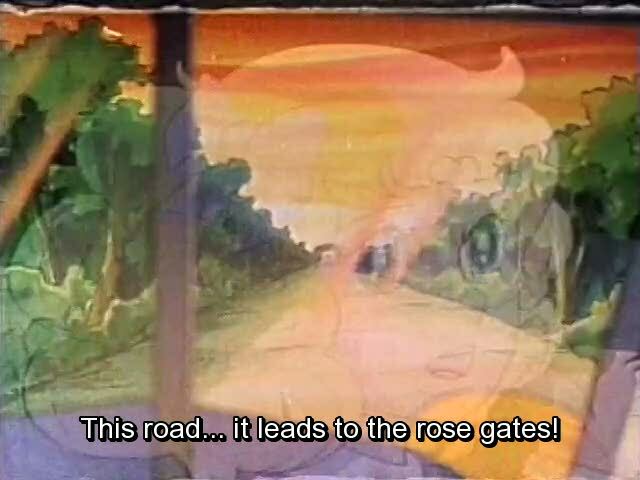 As the car heads up the road, Candy remembers that this road leads to the rose gates where she met her prince. As the car approaches the house, Candy marvels that it looks like a castle and how she doesn’t belong here. 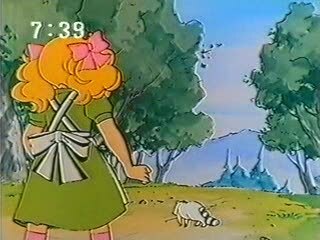 When the car stops, Stear and Archie greet Candy before greeting anyone else, Eliza runs off trying to find Anthony and they leave Candy behind. 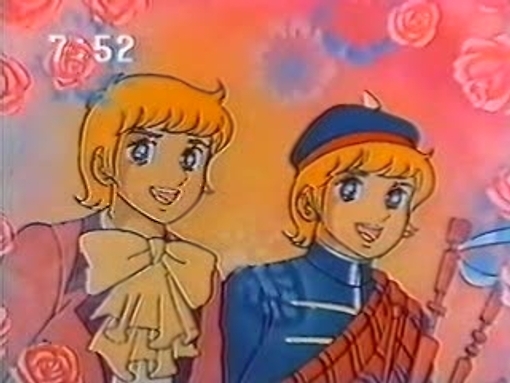 As Candy is about to be escorted inside by Stear and Archie, Candy spots her prince and they exchange glances, and Candy’s memories are stirred by the appearance of her prince. 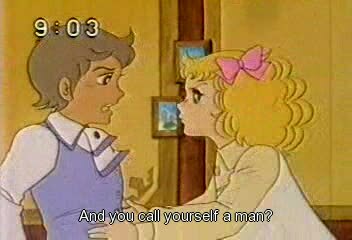 Just as Candy finds out that her prince is named Anthony, she figures out that he’s the one that Eliza likes, and Anthony formally introduces himself to Candy as Anthony Brown. 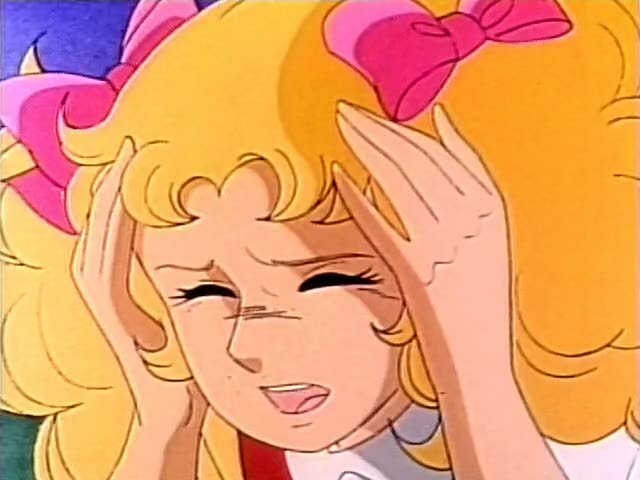 Eliza calls Candy her servant, Candy says she’s supposed to be her playmate, but Anthony says that since Candy was officially invited she gets treated the same as any other guest. Soon, everyone is called inside for the start of the party and Archie makes Candy laugh getting her in trouble with aunt Elroy, but Archie, Stear, and Anthony bail her out. As dinner begins, the three boys and Candy ditch the party to hangout together, and they tell Candy a ghost story about the house. 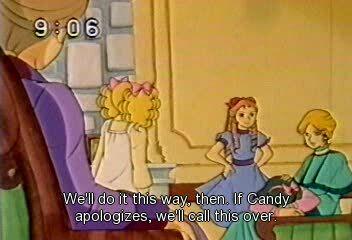 Later, the three boys leave Candy because they want to talk in private, and we see that Neil and Eliza were spying on Candy. 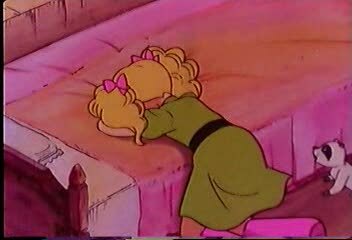 Neil and Eliza don’t want Candy to be here but they can’t throw her out because she’s a guest of Stear and Archie so Eliza says she has a plan. 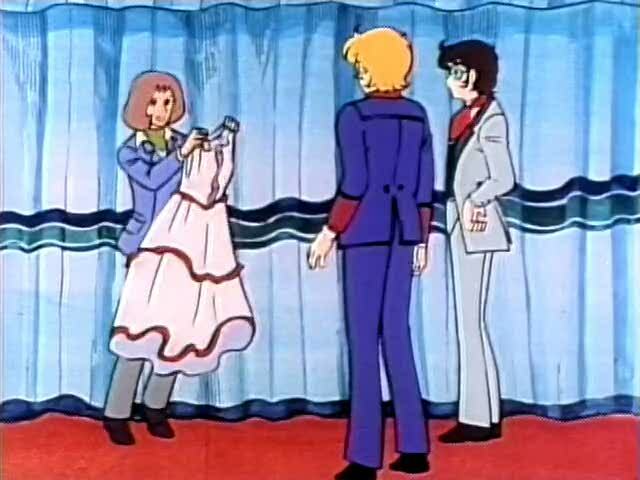 In another room, Archie shows off a dress he bought for Candy to Stear and Anthony, he didn’t want Candy to look out of place at the party. 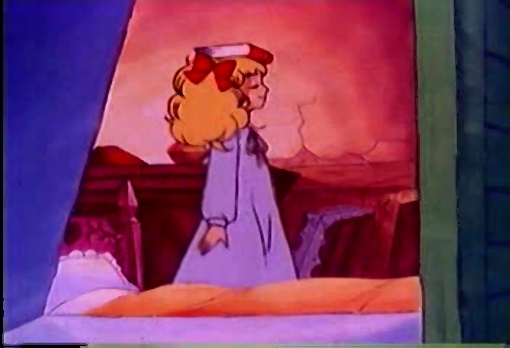 Eliza unleashes her plan on Candy, she fakes that she’s feeling ill and asks Candy to ready a bed for her, and Neil tells her that the last room on the third floor will do, Candy rushes off to get the room ready. 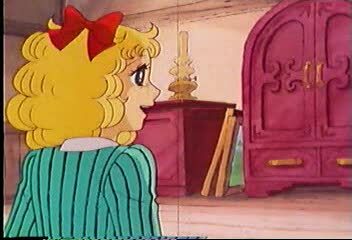 When Candy goes inside the room, Neil and Eliza lock the door behind Candy and tell her to beware of ghosts. Back with the boys, Stear also shows off a dress that he got for Candy, and just as they’re about to argue about dresses Anthony tells them to put the two dresses together while he tells Candy. Eliza tells Anthony not to worry about Candy but he tells her that Candy might have gotten lost and he has to find her. 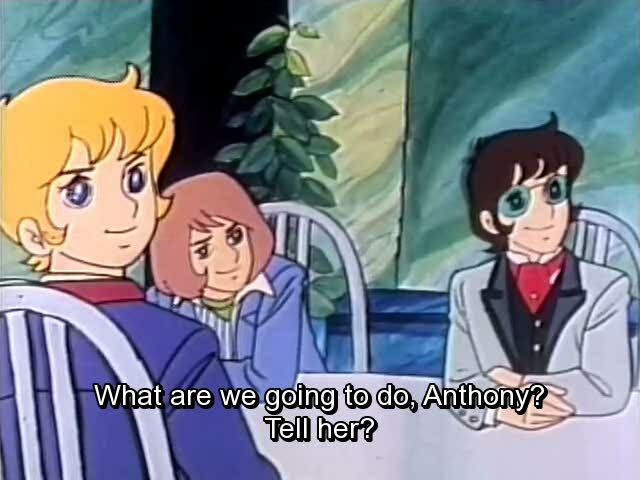 Candy starts to freak out inside the locked room while Anthony searches for her, but soon Anthony heads down towards the dance and gets dragged to the dance floor by Eliza. 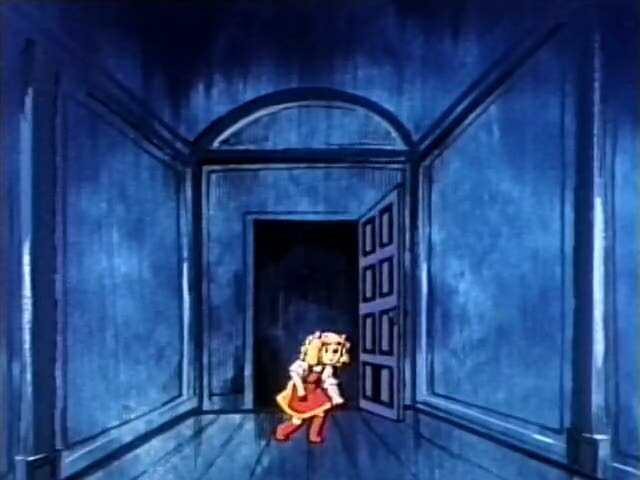 Candy eventually manages to force the door open, and she runs into Anthony who she thinks is a ghost. 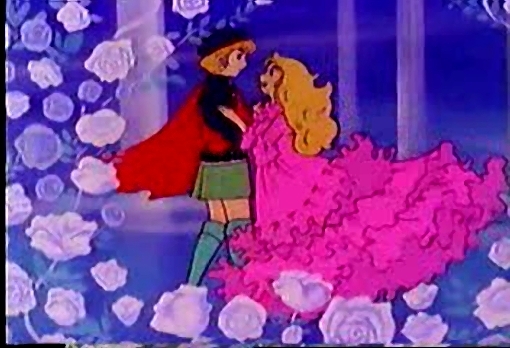 After Anthony rescues Candy, he takes her to Archie and Stear who’ve have finished the dress for Candy. 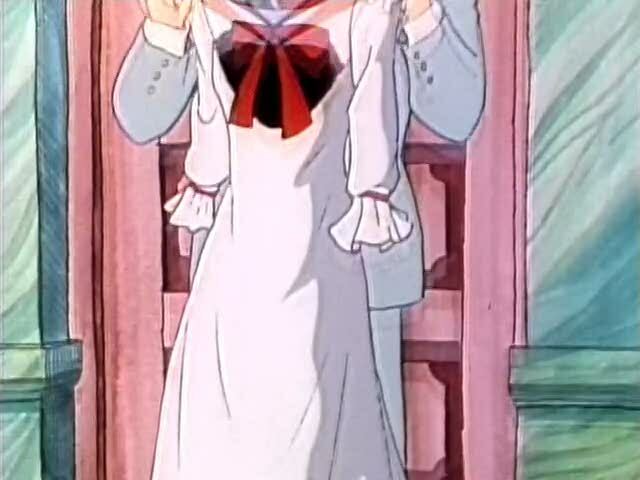 Candy puts on the nice dress that the guys made for her, and Anthony lets Candy wear some of his mother’s jewelry. When Candy makes her appearance escorted by Archie, Stear, and Anthony it draws shocked stares from the crowd. Anthony grabs the first dance with Candy, then Stear and Archie get their turn dancing with Candy. 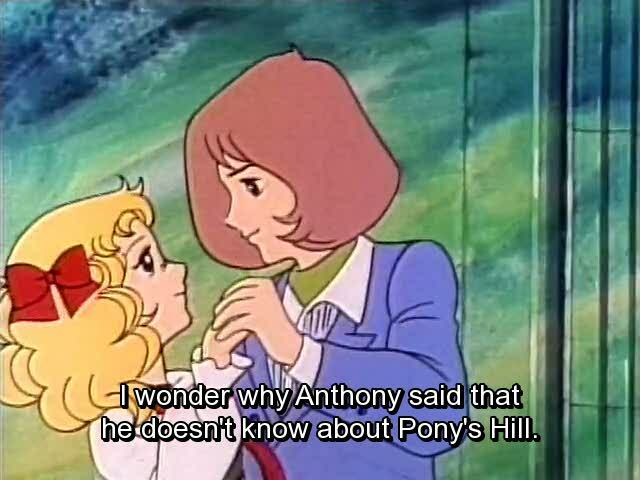 When Candy and Anthony are dancing she asks him if he knows Pony home, and Anthony says he doesn’t. Eliza and Neil’s mother says that the crowd thinks that they were compassionate for bringing a servant to the party but her husband says that they really disapprove of the idea but Candy’s pure nature wins them over, and she thinks to herself that she can’t let this go on for much longer. 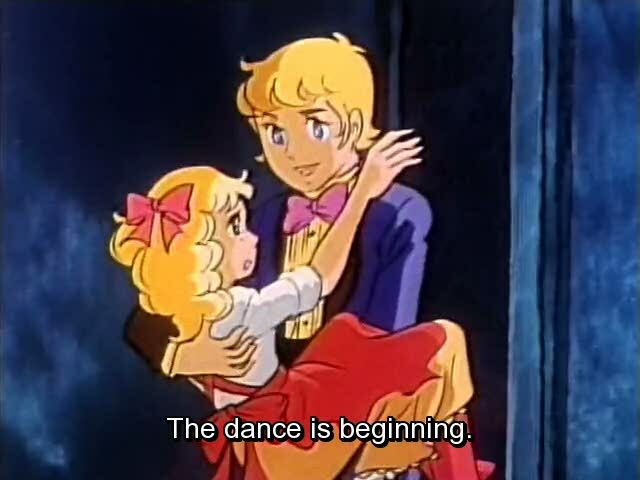 Candy thinks to herself that while she enjoys dancing with Archie and Stear her dances with Anthony remind her of that gentle moment with her prince on the hill. Well, that’s all for this episode. 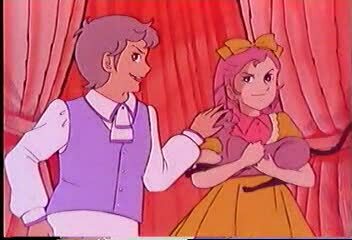 Well, Candy finally got to meet her prince on the hill or at least she thinks that he might be her prince, but I think that Anthony isn’t her first prince and I think that Candy realizes it too. 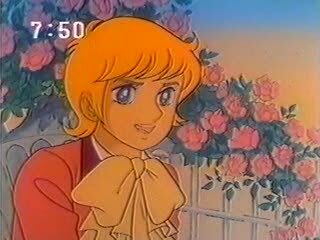 Anthony does closely resemble Candy’s first prince from Pony home but I think that Anthony is too young to be Candy’s first prince. 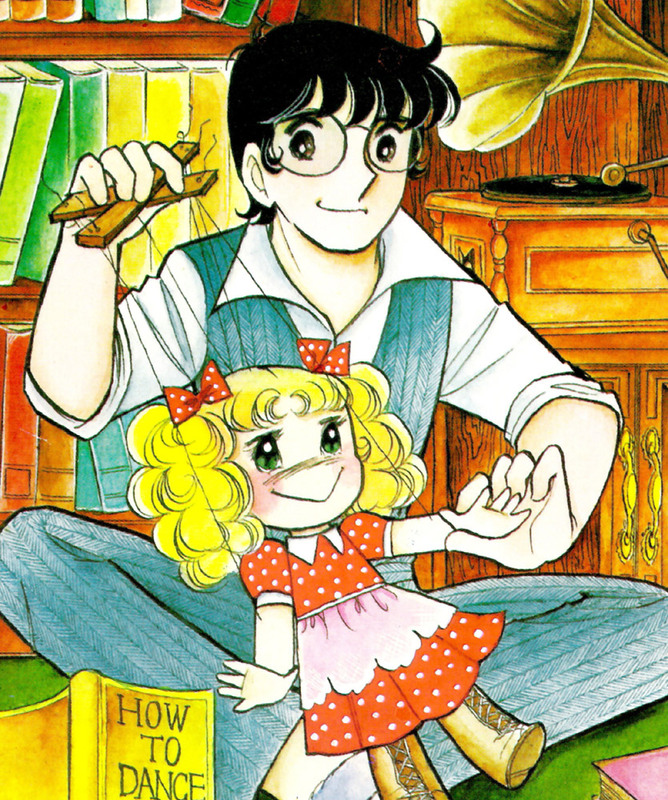 I think that Neil’s and Eliza’s father has it right about Candy, she’s a pure and honest girl and it shows, and while it might endear some people to her most of the rich older folks still don’t approve of her. 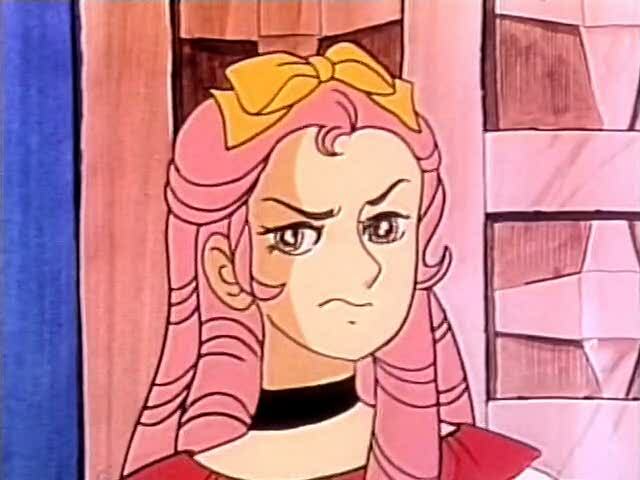 I feel that Anthony, Archie, and Stear are attracted to Candy because they can see what girls like Eliza are all about and they just can’t compare to a girl like Candy. 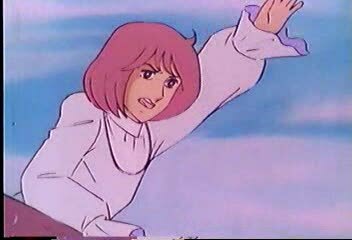 While Candy might think that things are looking up we can see the storm clouds gathering in the distance; Candy is too much of a threat to the natural order of the Leagan household and the mother will soon take action. What I don’t like is that the father knows what’s going on and he fails to take action, he knows that Neil and Eliza are spoiled brats and he knows that having Candy around should be good for them but he really lends her no support. 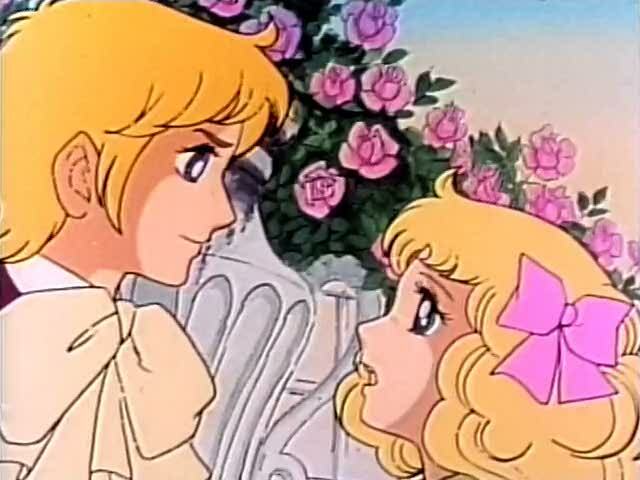 Candy Candy episode 8 review; Getting two invites from two princes. 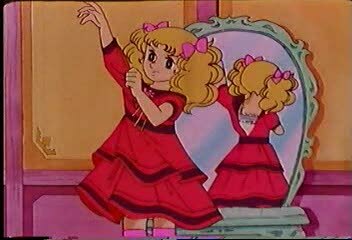 This episode begins with Eliza checking herself out in a mirror then she invites Candy to come along and help her shop for a new dress, Candy agrees to go with her. When the kids get to town, Eliza uses Candy as nothing more than a servant to carry her stuff, then Eliza sends Candy to buy a book for her, and while Candy’s inside the store they leave her behind. Candy says that they got her this time, oh well, I’ll just have to walk home. As Candy is walking through town she runs into Archibald’s (Archie) friend Alistair (Stear) he offers Candy a ride home in the car he built. 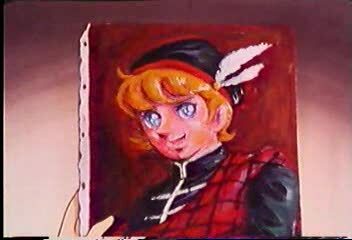 While driving Candy home we come to find out that Stear is related to the Adleys, he’s Archie’s older brother Alistair Cornwell. So, after they properly introduce themselves to each other, one of the wheels falls off Stear’s car and they end up in a lake. They decide to walk and take a shortcut through the woods to get Candy home, and we see that both Candy and Stear like climbing trees and so forth. 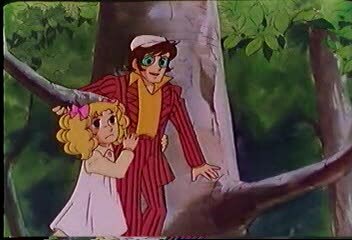 As Candy dances and swings through the trees, Stear seems a little smitten with Candy, then they part ways and Candy heads home. 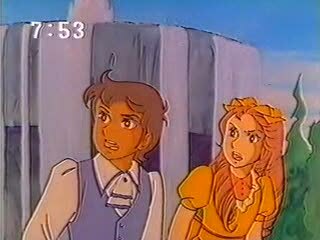 When Candy gets home, Neil and Eliza are very surprised that Candy made it back before nightfall. 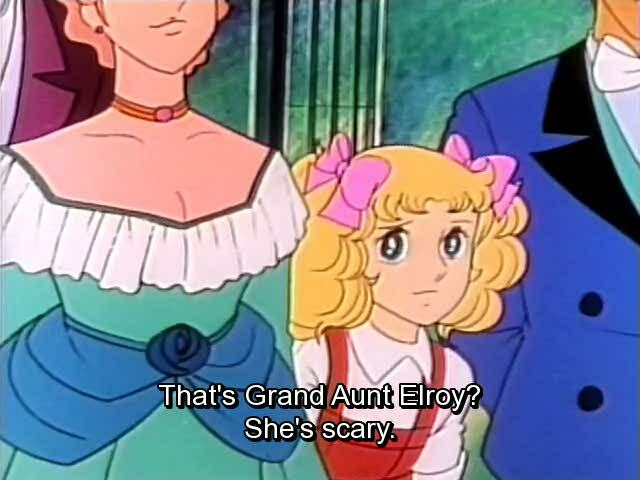 Then Candy overhears the staff talking about how the head of the Adley household is returning (grand aunt Elroy) and everybody seems worried about this turn of events. 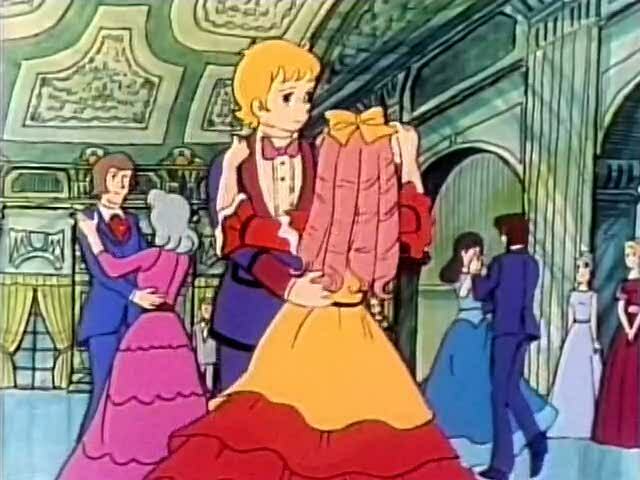 Candy figures out that’s why Eliza wanted to buy a new dress, a party in great aunt Elroy’s honor is being planned, Candy gets a vision of her dancing with her prince until she remembers that Neil told her that the special event that Eliza mentioned has nothing to do with her. 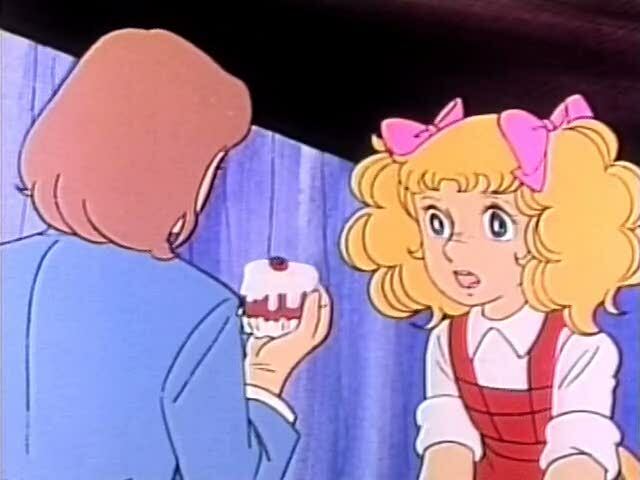 While Candy’s in her room, Dorothy comes by to talk with Candy, she asks if they played another prank on her? 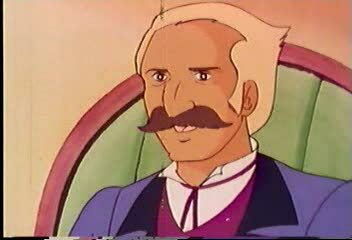 Yes, but it doesn’t matter because while I was looking for my prince I found a second prince. 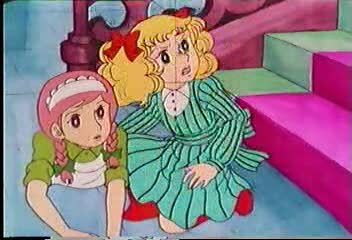 Dorothy then tells Candy that Eliza wants to see her, and she also asks Candy not to give in to them. 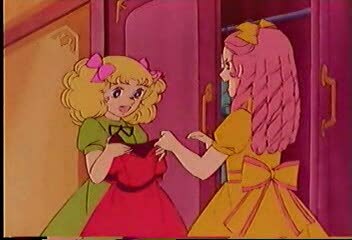 When Candy enter Eliza’s room, Eliza asks Candy how the dress looks on her, Candy says it’s wonderful, and Eliza tells her to keep her dirty hands off of it. 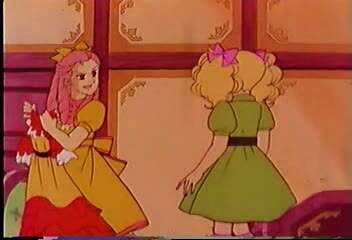 When Eliza leaves the room Candy checks out the dress, and fantasies about dancing with her prince until Eliza catches her, Eliza says that this is too good for a girl from Pony Home. 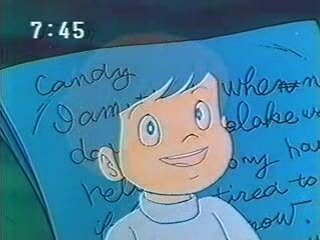 Candy is so filled with anger and rage that she trembles and shakes, back in her room, Candy cries in her bed. Later that afternoon the mail arrives at the house, and Eliza & Neil are shocked to find out that Candy has gotten two official invitations to the big party. 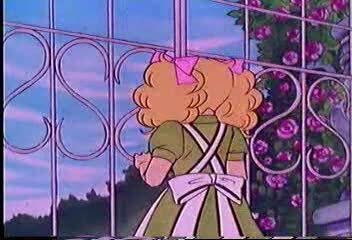 The father calls Candy down to inform her of the official invites, Eliza says that if Candy’s going she won’t go, but her father says that they can’t turn down the official request. 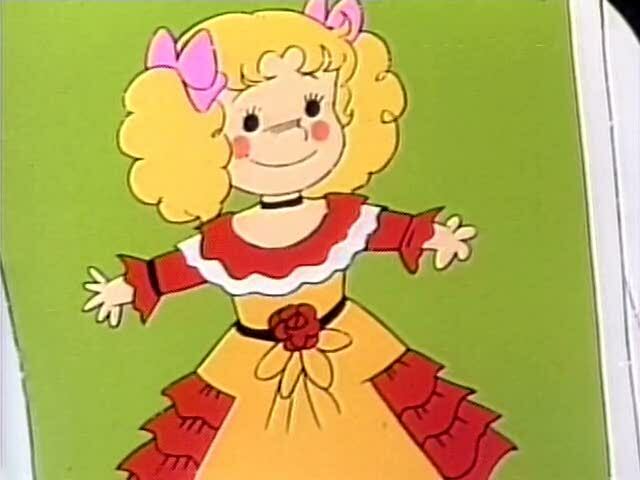 Then Eliza gets told to borrow Candy one of her old dresses, at first she refuses, but then Eliza gets a wicked smile on her face and says yes. 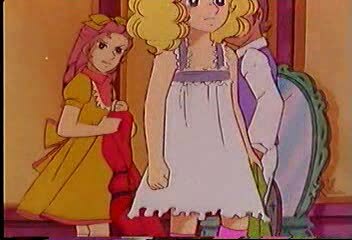 Eliza tosses Candy a dress and leaves then room, she tells Neil that she gave Candy a dress that is three years old so it won’t fit her anyways. When they return to the room they see Candy struggling to put on the dress, both Neil & Eliza call Candy fat and they tell her that she’s can’t go to the party looking like that. 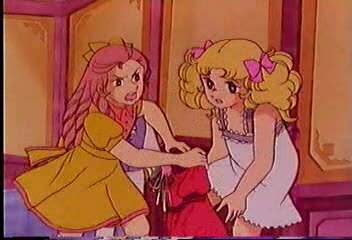 After Candy struggles with zipping up the dress, it rips along the zipper line, Eliza grabs the dress from Candy saying why did you ruin my favorite dress? 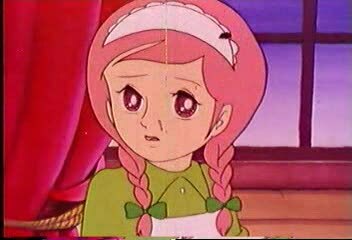 Candy runs from the room in tears, all the staff wonders why Candy is crying, Candy ends up crying in her room, and she wonders why Stear and Archie bothered to invite her in the first place? Later that night, Dorothy stops by the room to see why Candy is crying, and Candy tells her everything that happened. 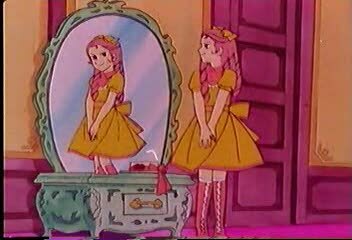 Dorothy tells Candy to stop crying, the dress doesn’t matter, go to the party with the dress you have, you’re a nice girl and that’s why Stear and Archie invited you, go to the party and smile. Candy agrees with Dorothy and says that she won’t cry anymore, she’ll go to the party and be herself. 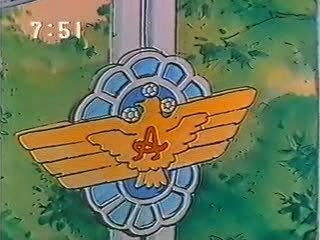 Well, that’s all for this episode. 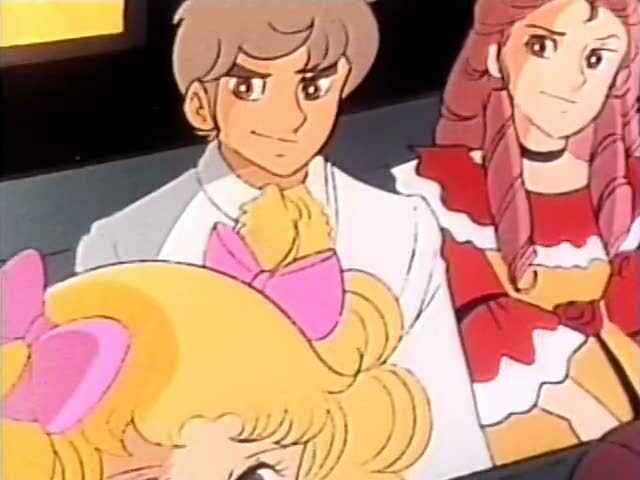 Well, no matter how nice Candy tries to be, it looks like Eliza and Neil can’t stop tormenting the poor girl. Eliza and Neil can torment Candy all the want and they can even get their temporary pleasure out of it, but in the end they’ll just look the uglier for it. I know that in the later episodes Eliza will become totally obsessed with why most guys will choose to spend their time with Candy instead of her. 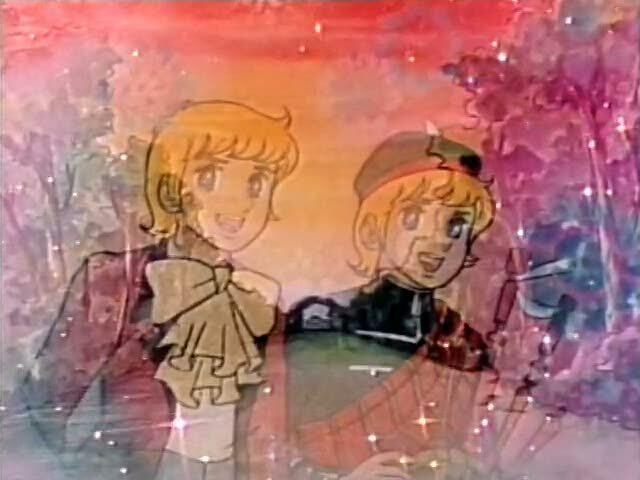 Candy is a free spirit, she moves with moment, when she’s happy she’ll show it, and when she’s sad she’ll express it, she’s free from the pretensions and posturing that both Eliza and Neil feel they have make because of their status. 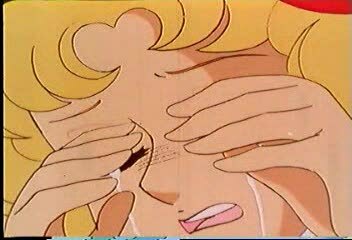 One of Candy’s most endearing traits will also be one of her biggest points of vulnerabilities, she loves freely and easily, and because she expresses her love openly it makes her vulnerable to people who would like to hurt her. 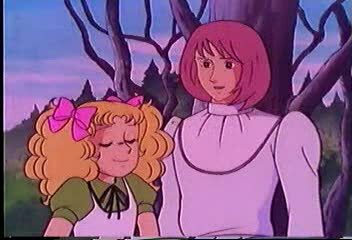 Overall, this was a great episode, Candy’s friendly and open personality just earned her another fan (prince). 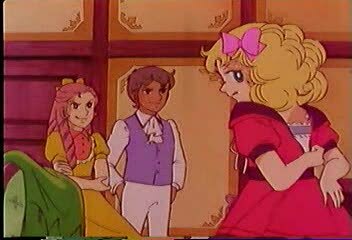 For all of Candy’s troubles what better situation could a sweet orphan girl be in; Having at least three handsome princes just waiting to slip that glass slipper on her dainty foot? Sweet, this shoujo at it’s finest. 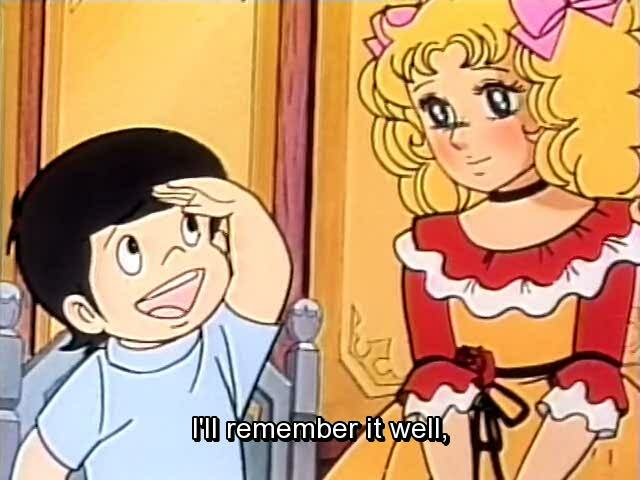 Candy Candy 7 review, trying to fit in, and being rejected. 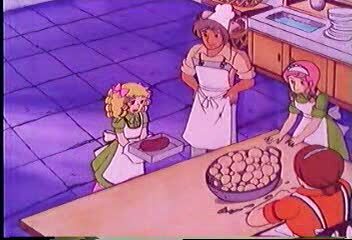 This episode of Candy begins with Candy baking bread in the kitchen, some of the workers worry about Candy getting in trouble for hanging out with them. 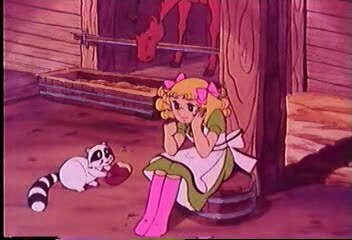 Candy takes her bread to the barn for Kurin to eat, and Neil and Eliza see her heading to the barn, and they use this information to get Candy in trouble. When Neil, Eliza, and their mother enter the barn, Candy gets accused of stealing food and sent back to her room. 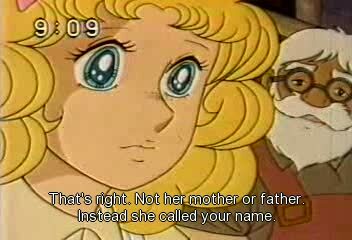 At this point, Candy begins to wonder what is she supposed be in the Leagan household, and why they want her to be here? When Neil, Eliza, and their mother return from a carriage ride, the father notices that Candy isn’t with them and he asks his wife why? 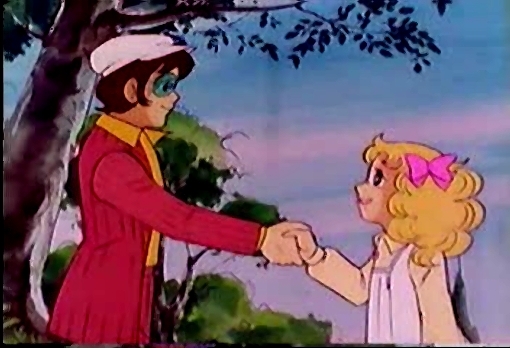 She tells him that Candy’s no good, but he says that the children need someone like Candy. 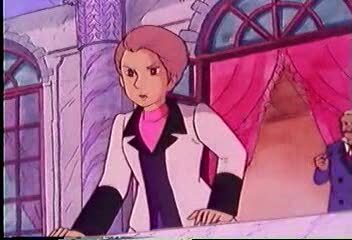 In the meantime, Candy has decided that if she is to become like a Leagan “lady” that her prince might stay awhile and not disappear. 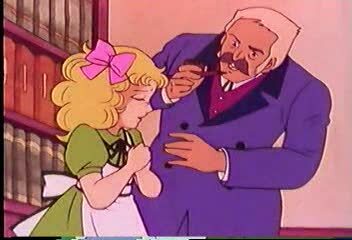 Candy then gets summoned to see Mr. Leagan, he tells Candy that he’ll be going on a long business trip, and he wants her to get along with Eliza and Neil. He also brings up the “stolen” bread, and wants to know the truth. 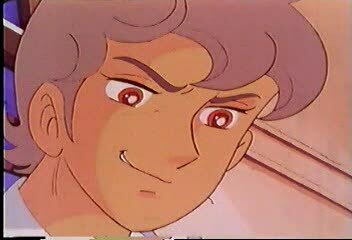 Candy takes him to the barn and shows him the bread, and that she’s keeping Kurin there, and he gives Candy permission to keep Kurin in the barn if she doesn’t let him in the house. 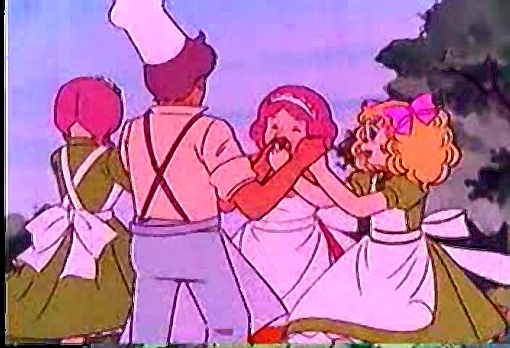 Neil, Eliza, and their mother are very upset when he tells them that Candy can keep Kurin in the barn. 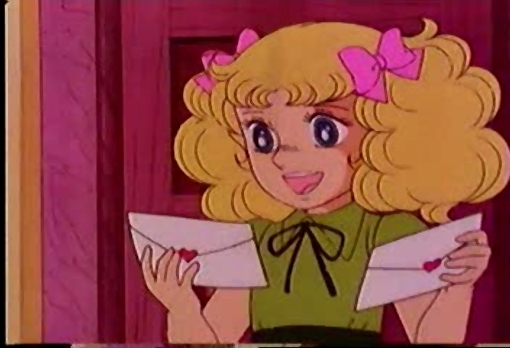 As the days pass, Candy continues to work on becoming a lady, and she writes a letter to Pony Home telling them about her quest to become a Leagan. 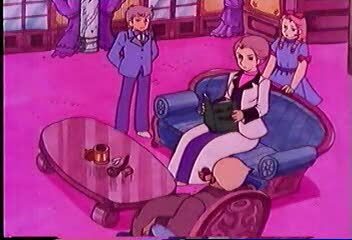 The mother notices that Candy is trying to act better, but Neil and Eliza continue to make fun out of her saying that even their cat has more elegance then Candy. 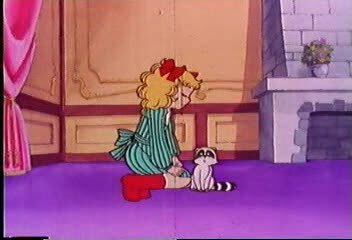 Then Candy gets in trouble for stepping on the cat’s tale by “accident”, and the mother calls Candy a violent girl. Since none of the Leagans are teaching Candy anything, she begins to try and learn stuff from the household staff, but when the mother sees this, she just gets angry. 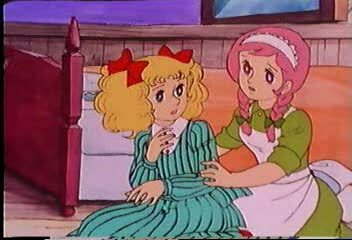 When Eliza sees Candy having fun with the workers she runs to her mother and tells her that Candy refuses to be her friend and playmate. 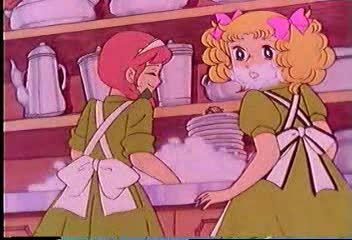 Then Eliza and her mother follow Candy to a party being held by the workers where Eliza tells her mother that they should turn Candy into house staff. 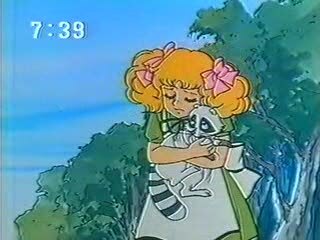 Later, Candy tells Kurin that soon she’ll be elegant Candy, and won’t be able to climb trees and do the same old stuff, so she decides to climb a tree for the last time. 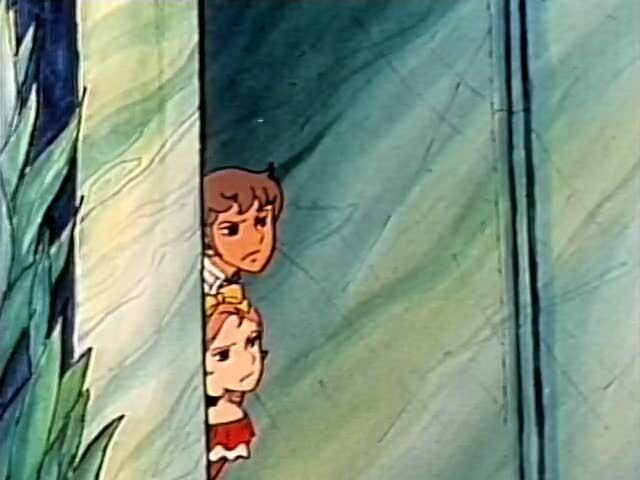 While up in the tree, Candy overhears Neil and Eliza talking about how Candy will now be their personal servant. 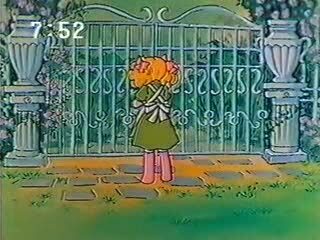 After Neil and Eliza leave, Candy wanders around wondering if Annie is happy where she’s living at, and soon Candy finds that she’s ended up at the gate where she meet the boy. 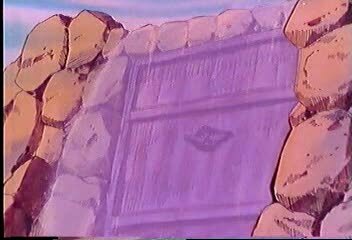 Candy walks around until she finds herself at a set of very impressive marble gates bearing her “prince’s” sign. When Candy sees the sign, she’s cheered by the fact that this property has to have something to do with her missing prince, and as Candy continues to wander around and she keeps seeing her prince’s sign in different places, and Candy concludes that this other piece of property is much larger than the Leagan’s. 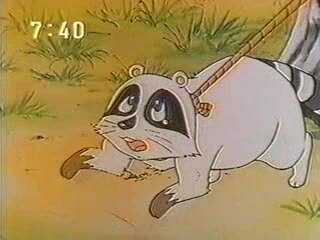 Later, Candy runs into young man, and she has to use some rope to help bring his boat back to shore, and they begin talking. 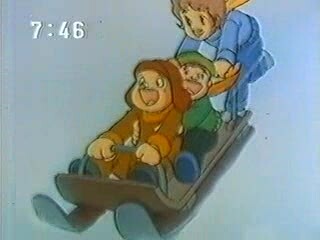 While they are talking, the boy tells Candy that she’s good with a lasso and he starts calling Candy “Miss Tomboy”, and as his ride approaches he tells Candy that his name is Archibald. 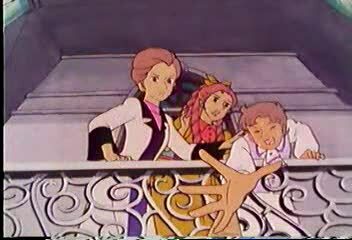 As Archibald leaves, Candy gets flustered because he winked at her, kissed her hand, and the blew her a kiss. 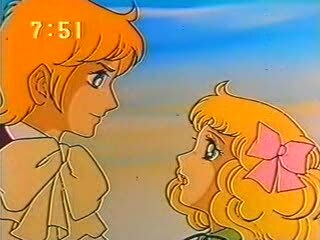 Candy wonders if Archibald knows who her prince is? After Archibald leaves, Candy returns to her old cheerful self again. Well, that’s all for this episode. 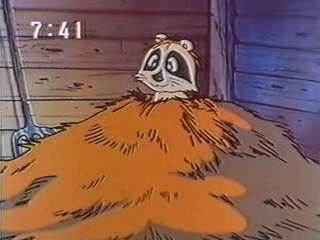 Well, in this episode Candy continues to try and fit in at the Leagan’s household, but her troubles continue. 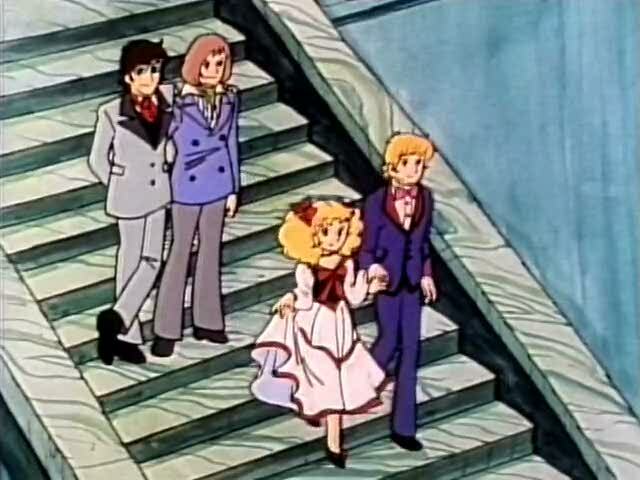 Even Though Candy tries to fit in, and the Leagan’s notice this, it seems that Neil, Eliza, and their mother won’t be satisfied until Candy’s spirit is broken. 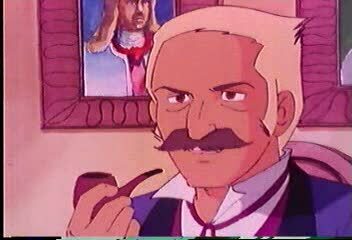 Mr. Leagan looks like he’s really not a bad guy, but he’s not around enough to be in control of that house. Candy really wants to learn how to be a proper lady but none of the Leagans give Candy anything but trouble, so she starts hanging around with the servants. 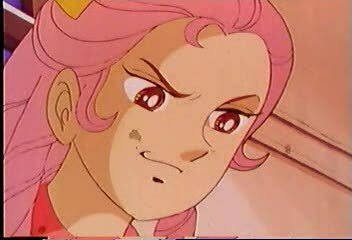 She’ll do anything to be around people who are kind to her, and this leads to her getting in further trouble. 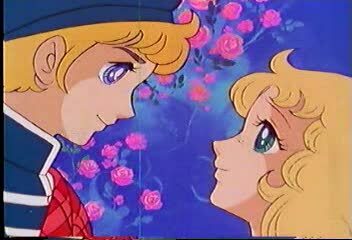 But, Candy has found another bright spot, she met another nice young boy/man near the estate that has her “prince’s” sign all over the place. Will these boys lead Candy to her prince, or will they become her prince? Only time will tell. 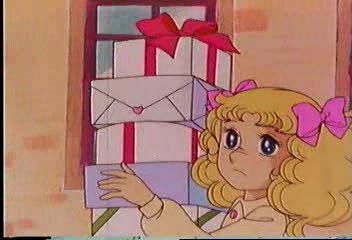 Candy Candy 5 review, a flower in the attic. This episode begins with Candy telling Sisters Lane and Pony that she will be going to Lakewood to find her happiness. When Sister Pony asks her why the sudden decision, she tells them that Annie and everyone is always saying that you must find your own happiness so she’s going to find it herself. Sister Pony gives Candy her own cross as a gift, and Sister Lane gives Candy a new set of PJ’s as a gift. 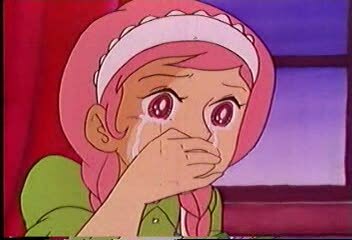 Sister Pony tells Candy to be strong and not to cry when things get tough, and Candy asks them not to tell the other children that she’s leaving. The next morning Candy goes and says her goodbyes to all the children before they awake, Sister Lane says that of all the children Candy will be the hardest to let go. 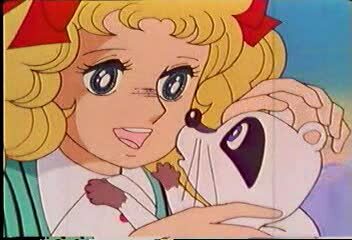 As Candy is walking away from Pony home Kurin tries to leave with her but she tries to give him the slip but he won’t leave her so she tells him to come along. As Candy is walking to Lakewood she runs into Tom and his father, Tom seems to be doing very well with his adoptive parents. 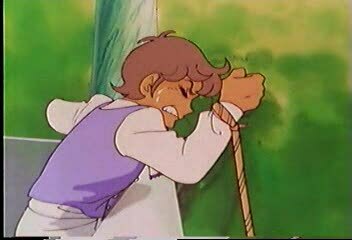 Tom and Candy have a lasso contest and Tom finally beats Candy, he tells her that he always did his best because of her. When Candy tells them that she’s being adopted by the Leagans Tom asks her if she would be better off with a regular family, she tells him that she will always be Candy. Tom’s father thinks that it’s a bad idea for Candy to move in with the Leagans but he keeps his thoughts to himself, and her tells her to be strong, cheerful, and not to cry. 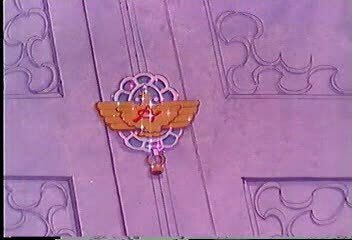 When Candy gets to the Leagan’s house she thinks that it’s right out of a fairy tale, but as she walking up to the door some children (Eliza and Neil) dump water on her from above and make fum out of her. 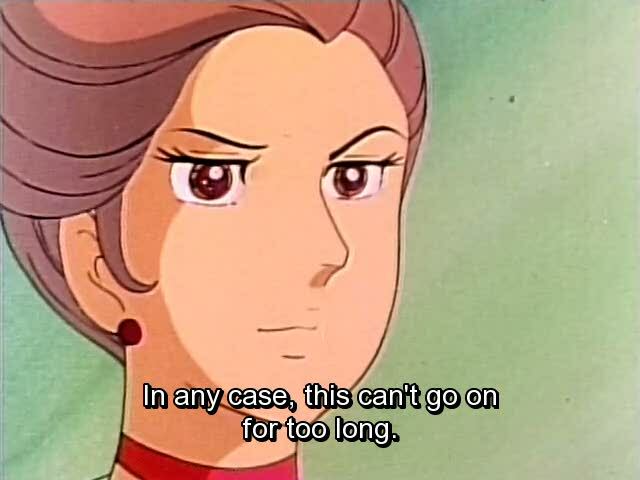 So, Candy uses her lasso to capture Neil, but as she demands an apology, Neil’s mother comes out to see whats going on. 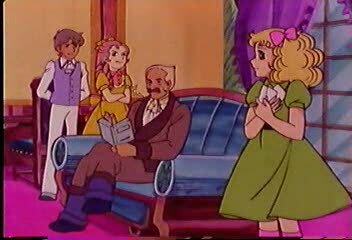 Later, Candy gets introduced to the family by Mr. Stewart, and Candy wonders where the prince on the hill is. 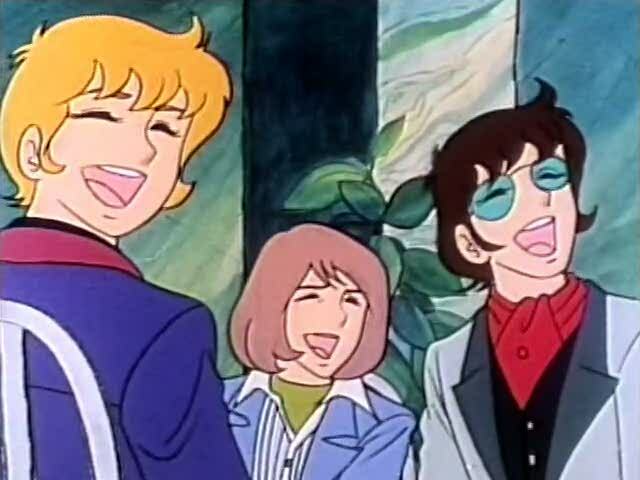 When Candy tries to talk to Neil and Eliza with a friendly tone their mother tells her to call them mister, and miss, and Candy asks if that’s the way siblings talk to each other. The mother asks Mr. Stewart what was Candy told, well, he says that Mr. Leagan wanted Candy as a playmate for Eliza. So the mother tells Candy she’ll be treated as a daughter but she shouldn’t think of Neil or Eliza as her brother and sister. 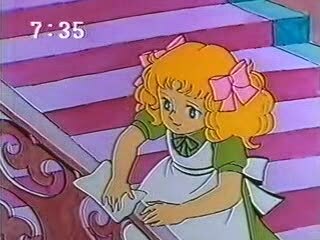 Later, a maid (Dorothy) comes to show Candy to her room in the attic, on the way up Neil and Eliza try to throw a cat at Candy but she dodges it and it hits Dorothy knocking her down the stairs. When Neil uses Candy’s new PJ’s as a rag to wipe his shoes, Candy attacks him, then Neil and Eliza are saved by Mr. Stewart. 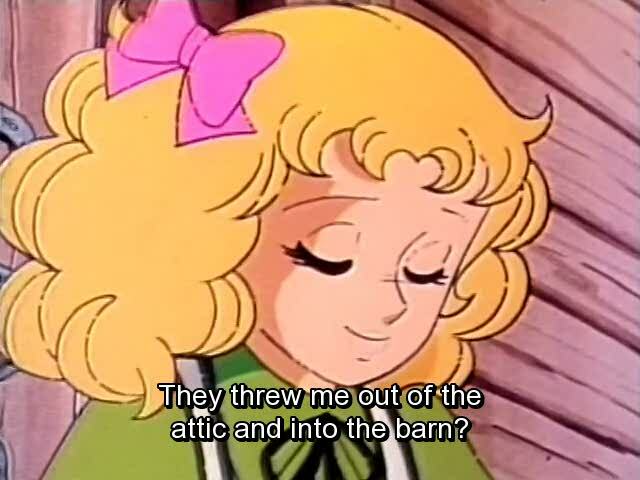 Later in her attic room, Candy says that even though the room isn’t the prettiest it is still a room just for her. Later the mother calls Candy downstairs where she tells Candy to apologise or leave, and Candy says that she’ll leave rather than live with such horrible people. 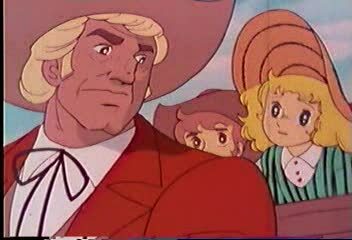 Just then, Mister Leagan walks in and tells them the he thought that a strong country girl like Candy might strengthen them up, as they begin to argue with him he tells everyone to just let it go, and then he retires form the room for the night. 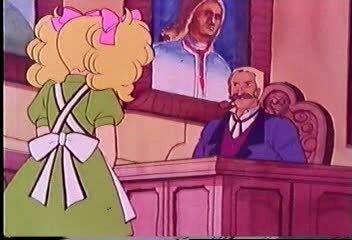 After the father leaves the room, Neil and Eliza still demand an apology from Candy but she refuses to apologize, so the mother tells Candy that if she refuses she will fire Dorothy. 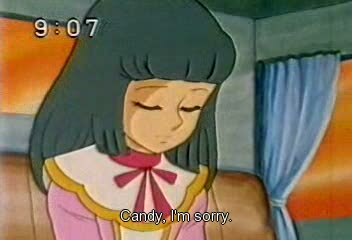 They make Candy kneel and apologize in order to save Dorothy’s job, and later when she’s in her room Candy breaks down in tears even though everyone told her to be strong. 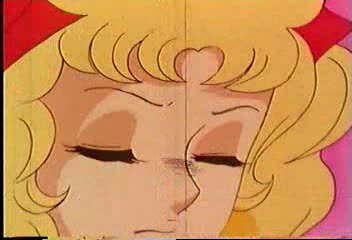 As Candy is crying in her room, Dorothy comes in and consoles her, and Candy asks her if she’s unhappy and why she just doesn’t leave. 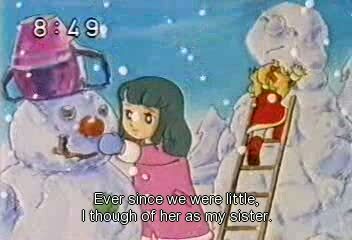 She tells Candy that she has eight brothers and sisters, and that whenever she’s unhappy she just thinks about them. 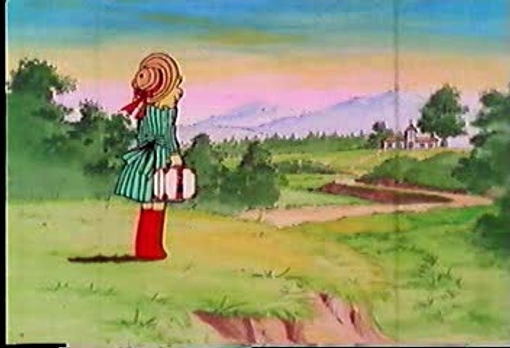 As Dorothy and Candy are talking, Kurin knocks over a picture and it turns out to be Candy’s prince on the hill, and Candy asks if Dorothy knows him, and she says yes he comes around every once and a while. 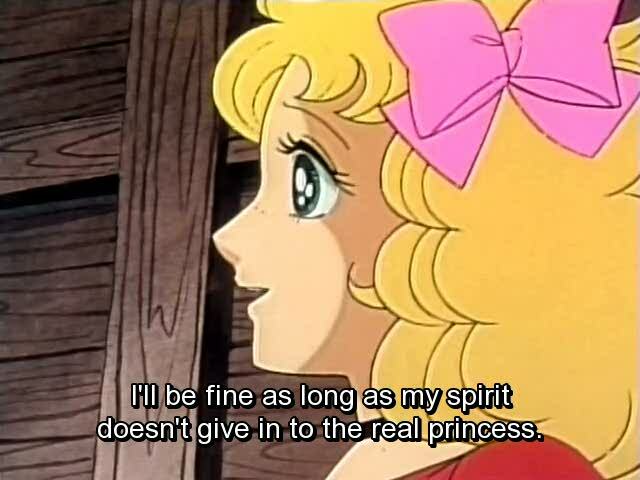 So, Candy resolves to stay and tough it out because she’ll soon be with her prince. Well, that’s all for now. Sometimes fairy tales come true and sometimes they don’t, and it looks like Candy’s tale is about to turn in to a Brothers Grimm dark tale. Candy the bright, cheerful, outgoing girl who’s never lied in her life has just walked into a den of wolves, and since she’s never dealt with those kind of people she’s in for a rude awakening. Mr. Leagan’s intentions might have been in the right place by wanting Candy to change his children, but he clearly doesn’t like strife so he won’t stand on the side of right. Candy, at this point should have gotten the hell out of that house but decides to try and tough it out after talking with Dorothy. 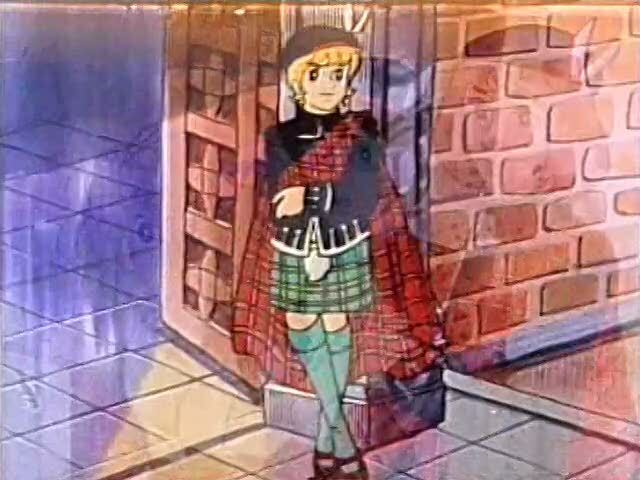 When Candy finds out that her “prince on the hill” visits the Leagan every so often it just strengthens her resolve to stay, ah-love, what a powerful thing. 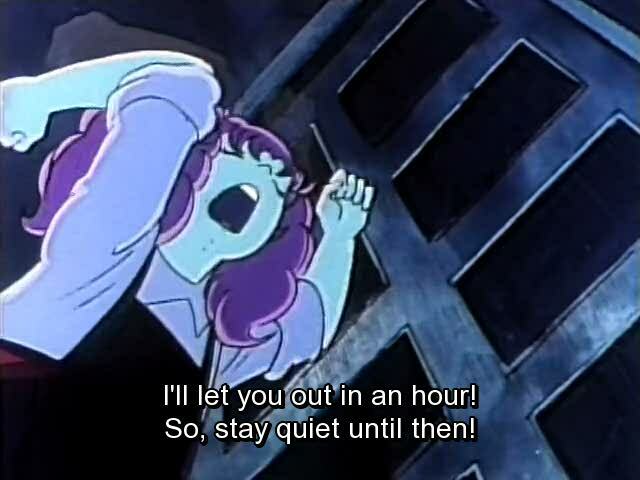 This anime is great shojo melodrama, the romantic dreams of a sweet young girl collides with the cruel reality of a uncaring household, while life for Candy will be dark and foreboding, it will make her moments of joy even sweeter.